Whilst most of you are still nursing their NYE hangovers, I’m once more trying to get over my Indo hangover. I’ve spent Christmas in Sumbawa and NYE in the plane. For the first time in 15 years I did not drink a drop of alcohol over NYE as I was just about to board the plane to Sydney at midnight (In Austria they say, you’ll spend the year like you’ll NYE. Excellent, that means I’ll be travelling lots…). 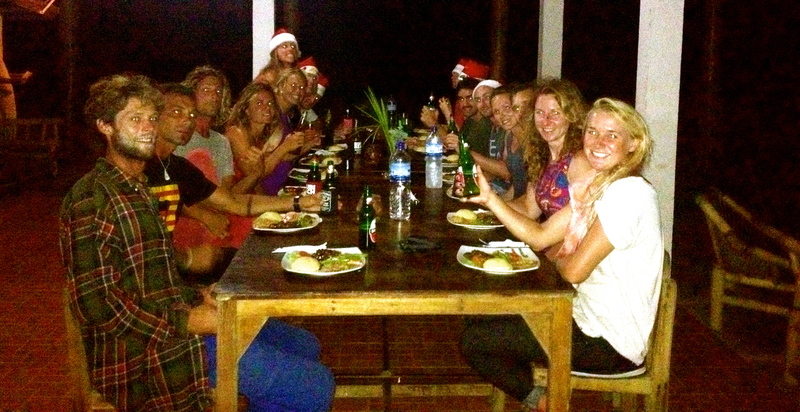 Not only NYE, Christmas in Indo was very different. At the same time it was very special. 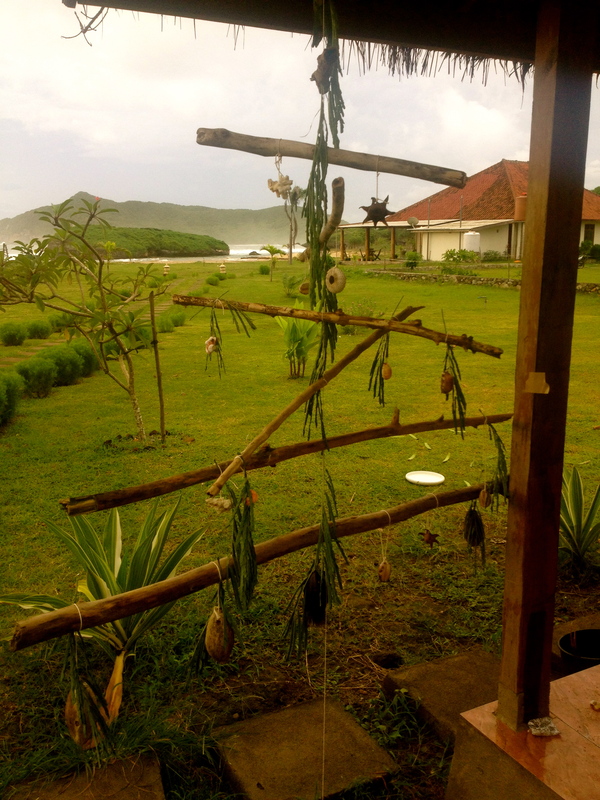 We did not have an actual Christmas tree but something that resembled a Christmas tree made out of shells and wood collected from the beach. Christmas morning, I dressed up as Santa and got up really early to distribute Beng Beng amongst the other peeps saying at our place. I really enjoyed being secret Santa. Unfortunately, the stacks of Beng Bengs I’ve been eating throughout the trip, gave me away. Instead of indulgent Christmas brekkie, we headed out for a surf and oh my god, it was one of the best surfs I’ve ever had. 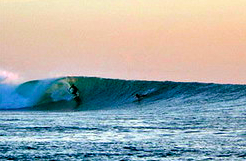 It was glassy, double overhead on the sets and five people out. One set was rolling in after the other. Everyone was hooting and stoked with Christmas cheer and surf froth. At one stage, a set came through that was barreling and all of us got barreled or close to with a ‘headspa’. I was so happy, I even forgot to drop in on my mate Simon. No seriously, it was a breathtakingly beautiful morning. The surf was pumping all of Christmas Day. So instead of eating and drinking, we spent the day surfing. The place we stayed at prepared Christmas dinner indo-style consisting of a ‘chicken steak’ i.e. an actual chicken fillet rather than the bony thighs of your usual chicken meal and mashed potatoes. Oh and Bintang. Lots of Bintang. Other than the 10 people staying at the bungalows we stayed at, some of the Aussie expats around the traps joined the little Christmas party too. So there was about 20 of us. The Christmas CD was replaced by live music. One of the Aussie expats all of sudden pulled out a saxophone and started playing. One of the Canadian girls joined in with her guitar and some singing. It was an excellent atmosphere. Happy days. My Christmas could not have been any more perfect, when my favorite ‘Austrian’ surfer rocked up in the middle of the night. 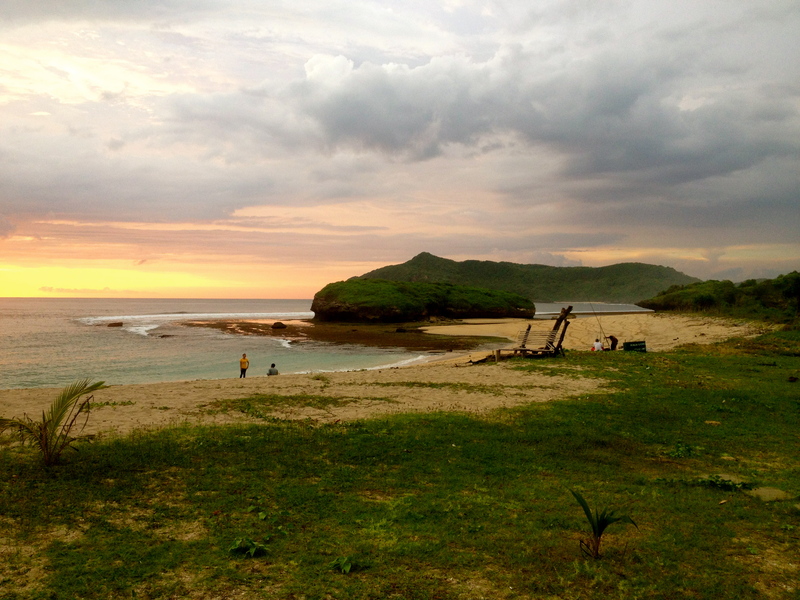 He made his way all the way from Sydney to Sumbawa on Christmas Day and arrived in time for a Boxing Day surf. The surf was still close to perfection. It had dropped quite a bit from the day before, but it had not lost anything of its glassy beauty. I did not think Christmas Day could get any better, but Boxing Day in perfect surfing conditions with special people from home was just unreal. I’ve spent the rest of the year in Sumbawa, having a ball and leaving at the very last minute to catch my plane back to the real world. Almost missed it but that’s part of another story. Awesome! I learnt Indonesian over the last year and now I can’t wait to actually visit Indonesia. Oh, and the surfing – looks like a paradise! Good on you for learning Indonesian. You’ll love it. Are you going soon?